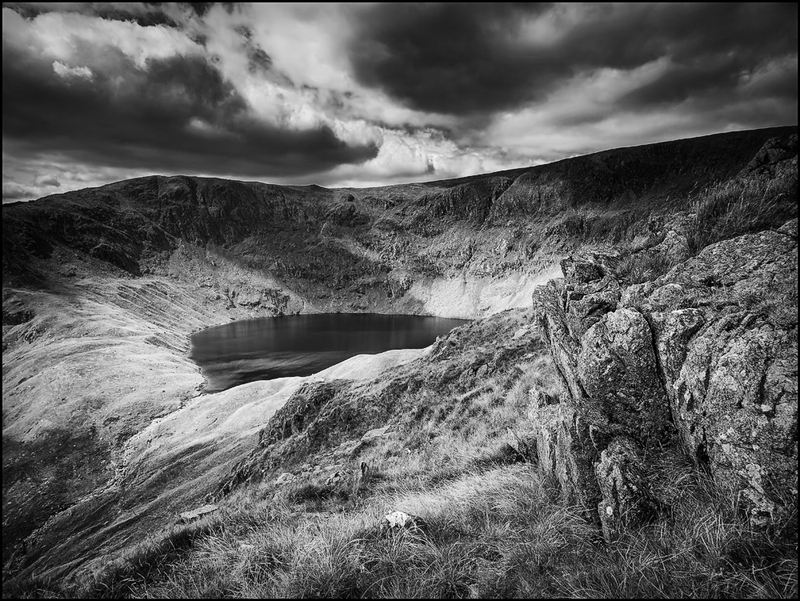 This Blea Watern tarn below High Street in the English Lake District. Captured using an Olympus 9-18mm lens on a GX1 body with a 0.6 ND graduated filter. Post processing in Lightroom and Nik SilverEfex Pro. Something I find really valuable is the Statistics module of my blog. Not only does this show me how my readership is growing but also how people have found my blog. One of the most interesting aspects of this is the section on search terms used as often these are people looking for answers to questions about Light Weight Photography. The title of this blog is one such question I have seen appear a few times. Firstly I will qualify my answer by saying I have not done extensive testing with all lenses and neither will I present lots of evidence to support my findings. I also won’t try to find the absolute best lens for sharpness or resolution. What I will present will be some practical thinking from the perspective of a Landscape Photographer using a Micro 4/3 camera that I think people might find valuable. Life’s too short to look at details that won’t show up in the final print. I would rather be taking pictures. The majority of Landscape images are created using wide angle and ultra wide angle lenses. It’s true that there are exceptions but I think 80% of shots are probably taken with a 28mm or wider lens (in full frame 35mm terms). In the Micro 4/3 world this translates into using a lens that’s 14mm or wider. For my own work I tend to use a 14-45mm Panasonic lens a lot especially when walking (possibly more so than I would have thought before I checked my archives). I think this is down to the way I use the smaller camera (GX1) as I tend to get down lower and move in closer to my subject than I do when I have a DSLR mounted on a tripod. This helps me make the most of the wide angle, emphasising the foreground and I often find 14mm is wide enough. This is a good lens in terms of contrast levels, sharpness and ability to resolve detail in subjects, even at distance. It therefore meets my criteria for a good quality lens that can be used for Landscapes. If you buy a reasonable example of this lens on the second hand market it will be a good investment. I know there are later examples of this lens when it was changed to a 14-42mm and also a Powerzoom variant but I have yet to see RAW files shot with these that measure up to the 14-45mm. The lens I went for was the Olympus 9-18mm but not because of the cheaper price. It was because it is not possible to attach screw in filters to the front of the Panasonic lens as the glass element extends beyond the end of the lens. Do I think I have compromised by buying the cheaper lens? Not at all. The Olympus is perfect, light and very small. It has a neat trick of collapsing down when not in use. This is also a brilliant lens for capturing sharp, detailed images with minimal distortion. It lacks the image stabiliser but that’s not really a problem for the sort of use it will be put to. So if I had to recommend one lens to use when shooting landscapes with a micro 4/3 camera, it would be the Olympus 9-18mm. Do you always use a tripod to negate the need for image stabilisation? Hi Stephen, with the GX1 or LX5 I don’t tend to use a Tripod, usually because I am somewhere up a mountain or in a city centre where its difficult. With these lighter cameras I actually prefer to handhold as it allows me to be more mobile. The wider aperture with good depth of field is also a contributing factor to allowing me to achieve good shutter speeds under most conditions. I probably use a monopod more often that a tripod these days unless I’m shooting sunsets or want to use a long exposure. Have you used the Olympus 12/f2? Or do you prefer the zooms because they have the option of going wider? David, no I haven’t tried the Olympus 12mm f2 although I have considered it. In the end I dismissed it as I couldn’t see any real advantage for me over the 9-18. I would probably not make use of the f2 and I can’t honestly believe the lens would appear any sharper than the 9-18. The other factor is that I shoot a lot in the mountains and hills and it’s not always practical to move in or out as you might fall off a ledge. A zoom is therefore very valuable under these circumstances. Straight forward and simple post. I’ve used the 14mm/f2.5 with the Panny wide angle adapter to achieve 11mm (22mm@35mm) until it was stolen recently with my G5. I buying a GH3 now and have been looking at wide angles and like you have come to the conclusion that the 9-18mm is the one for me. I have some great things coming up this year and this lens will get some serious use. Why you cannot attach a filter to the Panny lens is beyond me (also the adapter I used could not accept filters so I was limited to the 14mm) as it seems to me that they are losing sales because of this. Thanks for the post. Both the Olympus and the Panasonic are great lenses but the lack of filters on the Panasonic is a really deal breaker for me. The Olympus is also better from trekking due to it’s size and weight. Pleased you like the post.